Negan hasn’t even struck the first blow, and already we’re seeing what could be his villainous replacement on The Walking Dead. 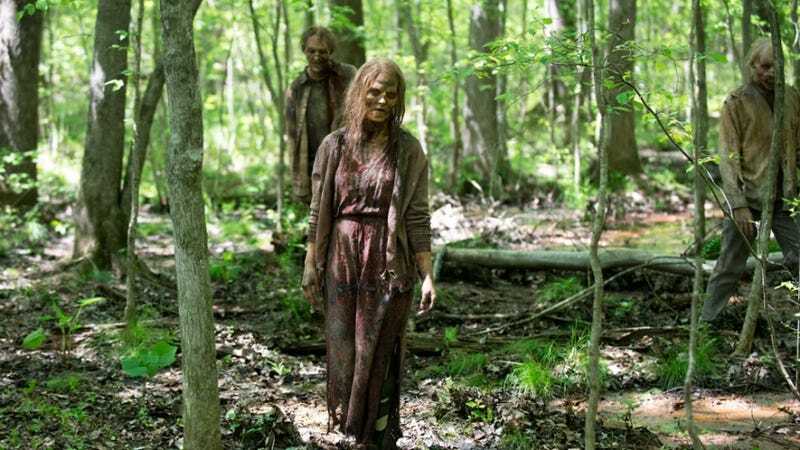 AMC shared an Instagram photo on Friday that teases a major comic book plot point: the arrival of the Whisperers, a murderous cult whose members disguise themselves from the walkers by wearing their skin. They don’t kill the undead, instead saving their ravenous bloodlust for the living. The photo hints at one of those rampages from the comics, when they attacked the Alexandrians and put some of their heads on spikes, establishing a border for their territory. The Whisperers, who get their name from the fact that they only speak in whispers (to stay hidden), were mentioned all the way back in Season 3's episode, “Clear.” Morgan, in one of his crazy rants, talked about seeing “people wearing dead people’s faces,” which many have taken to mean the Whisperers. A few fans have even theorized in io9 comments that Fear The Walking Dead is about the origin of the Whisperers, which would take that lackluster spinoff and make it way more interesting. Has The Next Villain On The Walking Dead Already Been Revealed? If the photo is introducing the Whisperers, it’s admittedly a bizarre time, given the fact that we’re only now just diving into The Saviors’ threat, with the promise of introducing The Kingdom and developing The Hilltop community. Still, it might make sense to slowly start integrating the Whisperers’ storyline into the show over the season, giving us plenty of anticipation for when they eventually arrive. I’m guessing the end of Season 7- so long as it doesn’t include another agonizing cliffhanger.